I’ve had plenty of long days in the saddle travelling from point to point. I’ve even done multi-day events but these have always either been supported or with a return to base in between. So I have never ridden with enough kit on my bike for an overnight stop. On a nice light race bike, lugging the required bits I’ve always thought would ruin the journey (not to mention those nice racing lines of the bike). Note, I’m too slow to actually race. But recently, that mindset has begun to change. The idea of being self-sufficient and disappearing off into the wilderness seemed like a proper adventure. Taking it at a more sedate pace and getting off the beaten track. 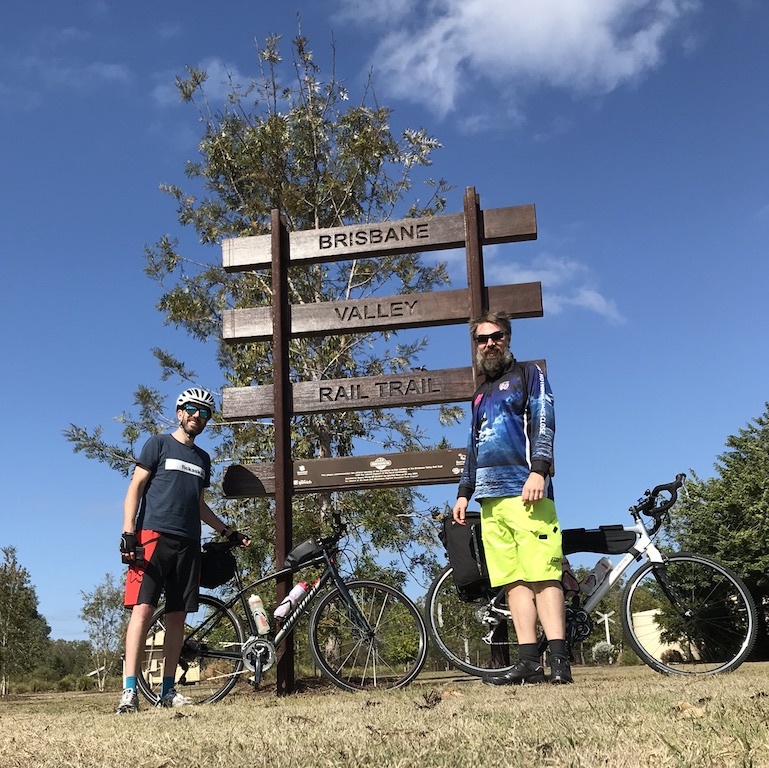 So when my buddy Andy, my host for my stay in Australia, suggested a trip up to the Brisbane Valley Rail Trail, I was certainly up for the challenge. There was one small problem; I didn’t have a bike. Well, that’s not strictly true but I didn’t have a suitable one. I had a 2nd-hand (at the very least), skinny-tyred carbon road bike that I was using for road-riding in and around Brisbane. This wasn’t the best for the gravelly trails of the rail trail. There was a solution, my friends had a spare bike, it was technically a ladies bike but nonetheless, it was a much more suitable bike. It had disc brakes and everything and the fit was actually pretty good too. Now we’re not talking a gravel bike here, more a flat-bar city-commuter. It had much wider tyres which was the main thing and would quite happily accommodate some luggage. For the luggage, I went minimal with one of those large saddlebags and a small top-tube bag. I had decided against wearing a cycling top in favour of a baggy T-shirt, I would regret this later on. This of course meant that everything that would normally be in my pockets, I would have to store in the top-tube bag. Luckily my large Waterproof Phone and Valuables Wallet would also fit perfectly in there. This was great as I could carry enough stuff in there that I didn’t need to carry a separate wallet. 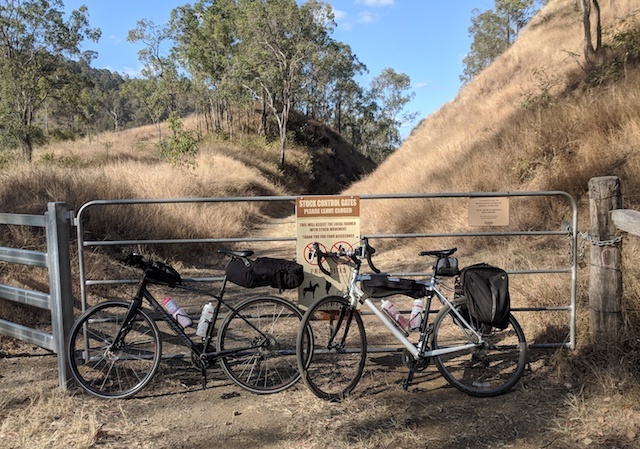 The Brisbane Valley Rail Trail is a 160 Km long disused railway line that has been converted into a dusty multi-use trail. Whilst I was up for the challenge of riding the entire length and back over the two days, this wouldn’t have been the point. We wanted to do lots of stops at all the interesting towns and villages along the route. More importantly we wanted to sample the coffee and cake in those villages. Think of it more as a bakery tour. So we picked two towns approximately 80 Kilometres apart and the route was set. We would park up at Esk and then ride up to Blackbutt on the Saturday before returning to Esk on the Sunday. It begins. Andy is tall but the camera angle makes him look giant here. Now let’s talk about accommodation. This was an introduction into bikepacking and we had minimal equipment. Plus after riding someone else’s bike all day, I wanted a proper bed. 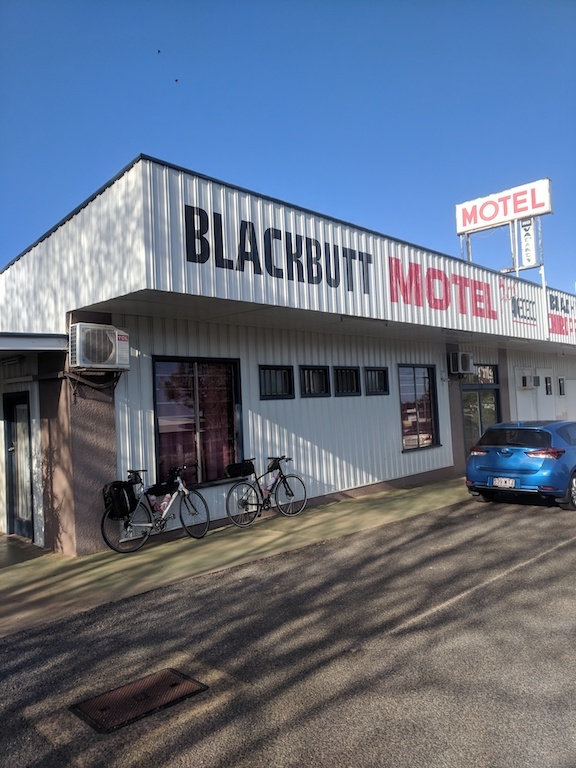 So we opted to stay at the Blackbutt Motel. A clean room, comfy bed and with a nice hot shower, perfect. 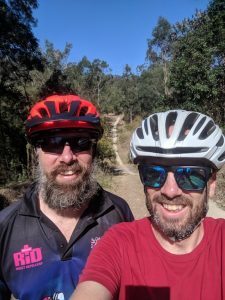 When I mentioned to some new-found riding buddies in Brisbane that we were planning on riding the rail trail, one question kept coming up; Are you riding tubeless? If not, prepare to get a lot of punctures so take lots of spare inner tubes. Duly noted. Oh and the magpies will swoop you a lot, more on this later. We had our equipment, we’d set a weekend and had decided on the route. The day arrived and we made our way to Esk to park the car and then start along the trail. The weather was warm but with a fair amount of cloud cover, this was good as most of the trail is completely open with very little shade from trees. As you would expect from a disused railway line, there are no serious climbs. Although we had lots of warnings about the long climb into Blackbutt when we mention to passers-by that we are going that way. This was something to look forward to at the end of the first day then. There are however, lots of little dips in the trail. Where the railway would have used a bridge to cross changes of steep gradient, the bridges are either not there or in a poor condition and unable to be used. What the keepers of the trail have done instead is put in nice smooth run ins and outs to these pretty short and sharp climbs. Getting the right gear and carrying your speed through the bottom made these fun. Failing to do that, as happened quite a lot with us, meant an un-elegant dismount and walking or grinding the wrong gear and trying to power through. The other thing to note about the trail is there are a lot of gates. These are a mixed bag. Some have cattle-grids that you can ride through, we even encountered one automatic gate. In the main though, they have locks and chains that you need to open and then close behind you. The gates are necessary, it is active farmland after all but we much preferred the cattle-grids as it didn’t mean we had to stop and faff. Towards the end of the day however, we were grateful for the rest. It was not appreciated on the occasions where the gate is at the bottom of one of the aforementioned dips in the trail as was sometimes the case. Our first stop on day one was the town of Toogoolawah which meant coffee and bakery number one. It was pretty clear that these local towns have thoroughly embraced the fact that rail trail comes through. I use the term town loosely too, think a very agricultural town that is a main street lined with a few shops and cafés. There’s not a great deal to do or see there so having the added volume of people using the rail trail, will definitely be great for the local economy. Having said that, we hadn’t seen that many people yet on our ride. It soon became apparent why. During times of the year when the conditions are right, the bush is burned back. This keeps it under control and prevents bush fires from starting. Yes they really do fight fire with fire in Australia! This next section of the trail had been recently on fire. There was a brown track that we followed straight through the still smoking blackened fields. It was all very surreal with a strong smoky smell in the air. Following a fairly solitary ride, we arrived in Moore for our lunch stop. Right on the trail, we stumbled across a place that was busy with trail riders. The Old Church Gallery a is a quirky looking café and as the name would suggest, is part of an art gallery in a old church (clever huh?). There were two menu options, veggie curry or a farmers platter (an antipodean version of a ploughman’s if you like). The proprietress was keen to tell us that all of their ingredients came from local producers. We both went for the farmers platter and were not disappointed. It was a social place with good banter and everyone asking where we were headed. We were the only ones with luggage (and by the far the youngest) so provided some interest. When we explained our route, there were more warnings of watch out for the hill into Blackbutt, we were starting to get concerned now. Several people seemed to think that the trail was closed north of here due to the fires too. This could scupper our plans if true. The clientele at the café seemed to typify what we had seen out on the trail. To put it politely, it was a mature crowd. In our mid-thirties we’re no spring chickens but we were definitely amongst the youngest of the groups we passed. Aside from the occasional family with young kids out for a bike ride. The group in the café were taking some people out for their first ride and it was an eclectic mix of people and bikes. Mainly old mountain bikes and a couple of newer e-bikes but we even saw and old fashioned ladies shopping bike. The section of route from Toogoolawah to Moore is the flattest and most well maintained so is popular with first-timers apparently. It certainly was the easiest of the sections that we would do over the course of the weekend. After finishing off our lunches with some of their delicious homemade cakes, we left the café and headed north from Moore. The terrain was starting to get a bit more rugged now, could it be that we were approaching the dreaded hill? Amongst the trees either side of a small canyon we were approaching, swirls of smoke started to appear. It looked quite unworldly, like a misty fog but with a very smoky smell. As we stopped at a gate, a fire-truck pulled up on the road next to the trail. Is this as far as we could go? They we doing a controlled burn on the section of trail immediately ahead but we could go along the road for a couple of Kilometres and rejoin the trail where it crosses the road. Well that was fine then. A short blast along the road and we picked up the trail again. The sun was now fully out and it was hot. Typical that it would be hot for this climb! Thankfully, there was now a bit of tree cover but this came with another problem. A young couple heading the other way gave us a warning of there being quite a few feisty magpies along this section. For those of you without an understanding of Australian wildlife, spring is magpie swooping season. At this time of year, magpies get very protective of their nests and will take great pleasure in harassing anyone who passes too close. It became a bit like a WWII fighter movie as we shouted “magpie at 5 o’clock” to warn each other of another incoming attack. Depending on the direction of the trail and of the attack, sometimes you would see their shadow before you saw them. This was both helpful and scary. One of the many gates gave us time for a rest. As the weather got hotter, the terrain got a bit more rough and the gradient a little steeper. Could this be the dreaded hill? We spent a good long while on this next section trying to find tree cover from the heat but also being mindful that the trees are where the magpies are. We eventually arrived in the full cover of Benarkin State Forest, still waiting for a real climb. The forest was cooler and flatter but the trails had turned quite sandy in places. On my city commuter bike with still fairly narrow tyres, sand is not fun. Even more so with a top heavy bike carrying a giant saddlebag pendulum. By this point, Andy was starting to flag a little so we had a little rest in the cool sanctitude of the forest. We couldn’t be far off our destination of Blackbutt now and we had plenty of time left in the day before darkness would fall. In the back of my mind though was the fact that we hadn’t really done anything steep yet, was the big hill still yet to come? Leaving the forest, we rolled along the flat trails and arrived at our destination of Blackbutt. We must have done that climb after all. In need of some sustenance, we’d heard that Blackbutt had an award winning bakery. That award could have been best bakery in Blackbutt 1998 for all we knew but an award is an award all the same. We were not to be disappointed. Walking into the bakery we were greeted with three large fridge cabinets filled with the most amazing sugary goodness. Alongside these was another display cabinet containing all manner of different pies. We were in heaven. After what seemed like eternity trying to decide which cake to have (and having a pie to eat while we decided), we finally got our cakes and sat outside. 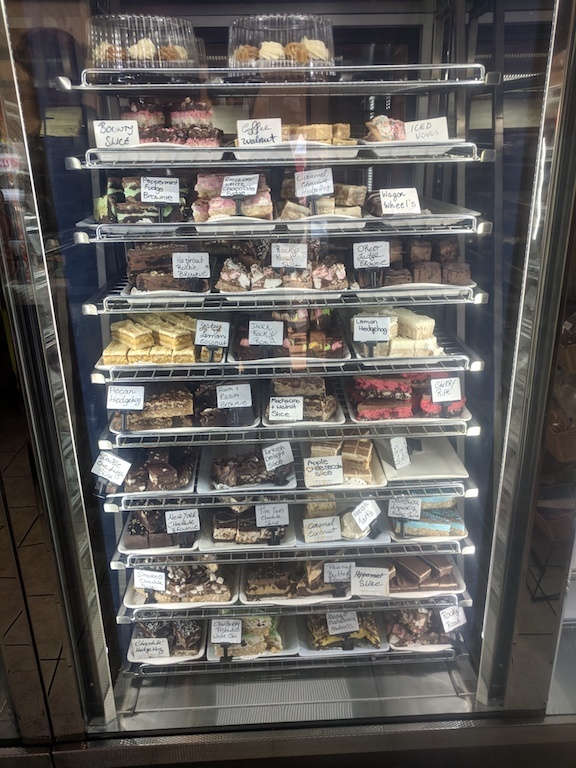 If you ever find yourself in Blackbutt and go to the bakery, I can heartily recommend the orange and macadamia fudge cake, it was pure filth. Time to reflect on our day. We were sat across the road from our motel but we still had an hour or so of daylight left. With our GPS watches showing we’d done 80 Km, we were both keen to make it to 100 Km. It’s only 10 Km up the road and back again we both thought and the sugar from those cakes is kicking in now. Let’s check in to the motel first and then head out. Crossing the road I hear this shout of “Are you Neil?”. What’s going on here I thought. Turns out the motel landlady had taken a stab in the dark as we said we would be arriving about this time and by bike. Still, it’s nice to be recognised every once in a while. All checked in and off we set. We had about an hour before sunset and 20 Km to do. With a bit of luck we would back before it got too dark. Remember what I was told about the trail before we came. Be prepared to get lots of punctures. Well we had made it to Blackbutt without a single puncture, this was about to change. My confidence was growing on the bike and especially the descents. On one such descent, I hit a bigger than usual rock which knocked the air out of my rear tyre almost instantly. There goes that luck needed to get back before dark. After a bit of struggling to get the tyre back on and faffing with pumps, we eventually got going. To do the full 100 Km, we would almost certainly be riding in the dark now. We had lights, not the kind to illuminate the entire trail but enough to see us out and back home just about safely. We pressed on for that extra few Kms before turning back. As the sun was setting, it was a beautiful sight. With Andy riding in front, kicking up a nice bit of dust, the low lying sun cast a serene light across the scene in front of me. 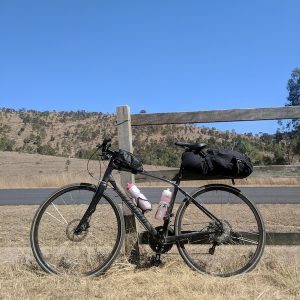 I had well and truly caught the bikepacking bug. By this point, my GPS watch battery had run out of juice and it felt like we had done way more than the extra 10 Km we had intended. We hadn’t, not even close. We pressed on, both determined to get that 100 Km tally (although with my GPS dieing, I had no way to prove it, if it’s not on Strava it doesn’t count right?). Eventually Andy slams on the breaks “That’s it, turn around”. We had done enough to mean that by the time we return to Blackbutt, we’d have achieved our goal of the magic 100 Km. Darkness was now setting in, which meant another of Australia’s wildlife delights; kangaroos. They mostly come out at night, mostly. If anyone has ever done any night-riding in the wilderness you’ll know that peripheral vision is not something that you have a lot of (with cheap lights anyway). Having experienced a deer running across my path on a mountain-biking descent a good few years ago, I was well aware of the dangers. It still catches you by surprise though when a kangaroo jumps into your light beam, even when we weren’t going fast. As a typical Brit in Australia, I still get all excited when I see a kangaroo close up. We arrived back in Blackbutt tired, hungry and surprisingly cold after such a hot day. Being a typical country town, the local hotel was the place to eat and drink. It turned out they stopped serving food in 20 minutes. Time for a very a quick shower and then onto dinner. We both fancied a good steak and the menu had a supersized one at 0.5 Kg. That’s nearly 18 oz of succulent juicy beef. When they arrived the waitress gave us a look of there’s no way you’re going to eat all that. We did, it was delicious and much needed as we had a lot of calories to replace from the days ride. After staying for a few local beers and listening to the live music in the hotel, we returned to our motel room. The end of a very enjoyable day. The following day we left our motel at around 7 am and went straight back to the bakery for our breakfast. What better way to start the day than with a coffee and one of the bakery’s fantastic pies. The weather on the second day was noticeably warmer and we were faced with the prospect of being in the most exposed area at the hottest time of the day. Bear in mind that this was September, so the start of spring. It surely must be impossible to do this route in the height of summer. My decision to wear a cotton T-shirt instead of a cycling jersey was biting me now. I felt pretty grim in the heat. Retracing our route back along the trail, we blitzed through the forest and emerged out into the baking sun. There was a noticeable descent this time, this was the hill that we had been told about. We just hadn’t noticed it on the climb up, we’re obviously fitter than we thought! The cruisy and slightly rocky descent made me wish that I was on my mountain bike. You could seriously smash this on something with a bit of suspension and wider tyres. The frequent stops for the gates put pay to any particularly long blasts however. After only one puncture on the first day, it was time to play catch up. I got two punctures in quick succession on this descent. Although the second one was entirely self inflicted as in my struggle to get the tire back on the rim, I must have caught the tube and given it a little snake bite of my own. A valuable lesson learned and lucky that we were carrying a lot of spare tubes between us. As the trail flattened out, we entered back into magpie territory on the run into Moore. Here the magpies became much more incessant. To my delight and much amusement, they preferred Andy over me. With Andy riding in front, I could see them flying above and preparing to swoop him so I could give a warning shout. I’ll be honest, I did shout out a couple of false ones just to watch him wave his arms above his head. Nonetheless, karma got me later that week when I got attacked by one when riding around Brisbane. It’s amazing how much your ears can bleed from a small cut. Time for our first stop of the day and to get out of the heat for a bit. A nice little café on the main street in Moore. Whilst we’re sat out the front eating, another couple of cyclists arrive and sit down at the table next to us. Recognising that we’re all doing the trail, we strike up a conversation with these guys. 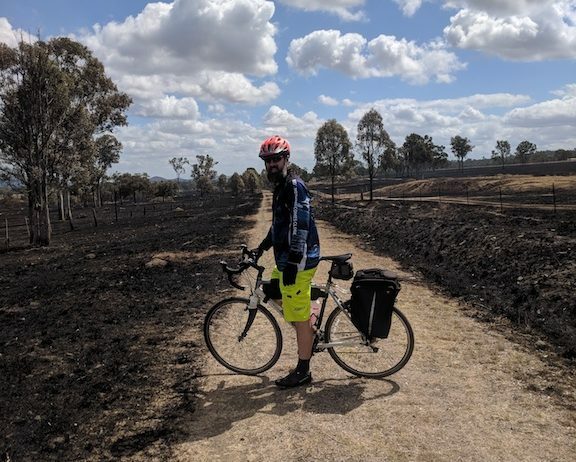 They’re just doing a ride for the day by riding from Toogoolawah to Moore and back again. They’re seasoned rail-trailers, having done this section of the route many times before. Interestingly, like most people we have encountered on the trail, a hardtail mountain bike seems to be the bike of choice. They set off before us but we soon see them in the distance and my competitive nature kicks in. Pushing a bit harder than we should in the midday heat, we catch them up, say a quick hello and try and get in front. Managing to put some distance between us, the heat is getting a bit much now and we look for a suitable place to stop out of the sun. We come across a welcome rest stop with a covered seating area and decide to have a short break. The guys soon catch us up and stop for a rest too and we continue chatting. Their comments are interesting. On the flat, they couldn’t keep up with us but on the dips they could close the gap slightly. There are lots of variables of course, we have considerably more weight on our bikes with the luggage. They have mountain bike gearing which would make the short climbs easier for them perhaps. They also have around 15 years on us which they were keen to point out too! 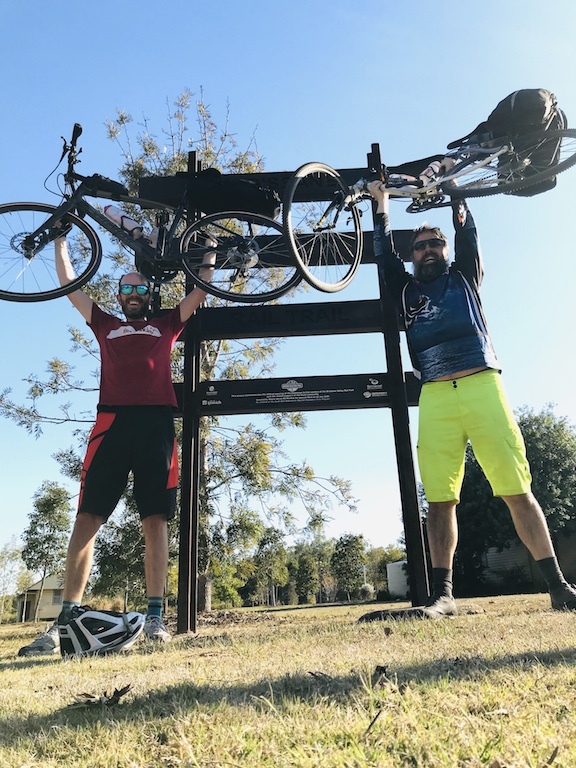 We part ways and ride on to Toogoolawah. One last coffee and cake stop (actually it was ice-cream this time) before the last segment back to Esk. By this point we’re both pretty tired, the heat has taken its toll as has the pace we’d set on that previous section. If someone could have gone and got the car and bought it to where we were I would have been quite happy. My bum was beginning to hurt a bit now too. Turns out that although a ladies saddle might be very good for supporting ovaries, mine were starting to hurt now, which was a more than a little concerning to say the least. Not wanting to live up to the stereotype of a whinging pom, we cracked on. As it got later in the day, the temperature was starting to drop a little, which was good as there was minimal shade from trees. Onto the last 20 Km of the ride but there was still time for one last bit of drama. We’re cruising now, both just wanting to get back to the car, conversation is at a minimum. On a slight downhill on a double track that allowed us to ride side by side, something startles Andy. Seen at the very last minute, a black snake in the middle of the track rears up and tries to take a bite out of him as we pass. I’ve known Andy for nearly 10 years, he’s the typical laid back Aussie that nothing ever really phases. This is the first time I’ve ever seen him flap so it must be serious. I decide not to stop and go back for a photo. As a rule of thumb, stay away from snakes in Australia. If it’s a black snake, stay even further away. This was a very black snake and potentially a seriously venomous one. We didn’t hang around long enough to do any kind of scientific analysis. Andy is still very shaken as we arrive back at the car where we left it in Esk. After the obligatory photo by the Rail Trail sign with the bikes above our heads, we pack up our bikes and head to the local shop. Recovery food consists of copious amounts of chocolate milk and more cake, of course. The drive back to Brisbane gives us time to reflect on what has been a sensational couple of days. 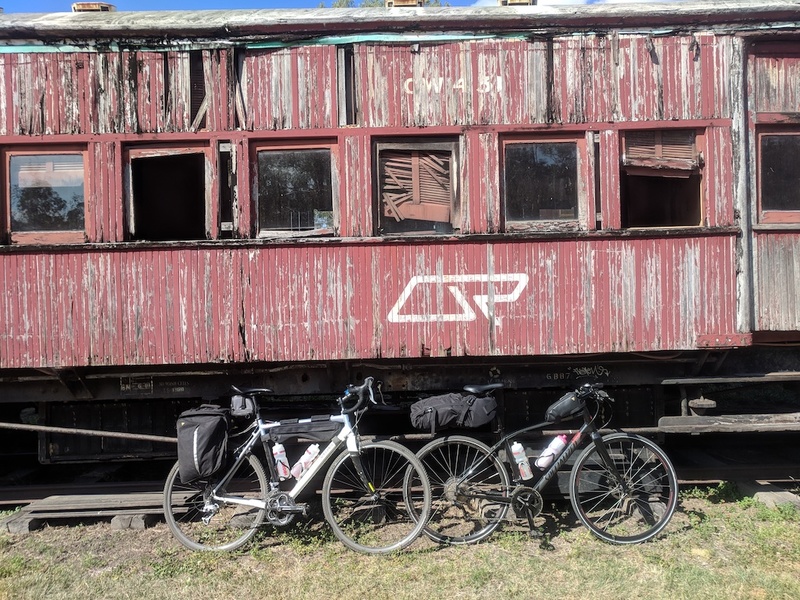 This trip was cobbled together on borrowed bikes and equipment but it didn’t detract from the fun and the sense of adventure. There were parts of the route where we could see no signs of civilisation around us for quite some distance. It was a great mix of people that we encountered along the way too, everybody was so friendly. Ultimately everyone was just out to enjoy riding their bikes in what was a stunning setting. Perhaps not unexpectedly conversation soon turned to what we thought would be the perfect bike to ride the trail on. This became a shallow attempt to convince ourselves that our next bikes should be gravel bikes. Wider, tubeless tires would be a must I know that much. Drop bars would have been good for the variety of hand positions and getting a good speed on the flatter sections. So basically a gravel bike then.